Anyone who has walked barefoot into a child’s room late at night will probably hate Lego bricks. That aside, Lego has got to be one of the best toys ever developed. It’s an open system with which you can build whatever you want. Lego took the simple wooden cube and turned it into a building block of the imagination. It’s a powerful thing for a child to realise that they can think of something and then create it. One wonders how many of today’s engineers have started that way? What goes around comes around. High on the moors in Cumbria, near the border with North Yorkshire, building block modelling has taken on a new relevance. Near the southern portal of Risehill tunnel, on the Settle and Carlisle line, a drainage problem has been rectified with the aid of those pesky little bricks. Not literally, you understand, but they were used in the development of an intricate concrete structure built from – yes, that’s right – interlocking blocks. And it’s pleasing to learn that the definitive Lego model was taken to site as a source of reference! On the Settle and Carlisle railway, dealing with the problems created by excess water has been ongoing since the line’s inception. That’s what you get, of course, if you run a railway through the high Pennines, but then climate change hasn’t been helping much of late. The Eden Brows landslip (issue 143, September 2016) is a case in point. Indeed, the remedial drainage works at Risehill have been completed, under a framework contract, by the same company that is undertaking operations at Eden Brows – Story Contracting. Just south of Risehill tunnel, the railway is carried on an embankment. A stream known as Cowgill Beck flows in a large culvert built on the skew through the base of it. In this vicinity, rainwater had been collecting which threatened to destabilise the embankment. A three-pronged solution was put in place to create a permanent solution to the surface and ground water problems and then to strengthen and protect the embankment. The location is wild and remote, so before any of this work could start it was necessary for Story Contracting to lay a 1.4-mile haul road. Making partial use of an existing forestry road, it traversed a plantation, known as Dodderham Moss, from the so-called Coal Road near Dent station – the highest station in England at 1,150 feet above sea level. This unclassified public road is narrow and twisting, with very steep gradients. Not for nothing is the approach from the valley to Dent station called the Corkscrew! Even just getting plant equipment and materials to the worksite therefore presented difficulties, with all heavy vehicles having to approach along the Coal Road from the direction of Garsdale. The largest item of mobile plant – Story Contracting’s 22-metre long reach excavator – had to be driven on its tracks from Garsdale station, a distance of over three miles to the start of the haul road. Over all of this distance, the road surface required protection from the vehicle’s tracks. The work on site was divided into three phases. 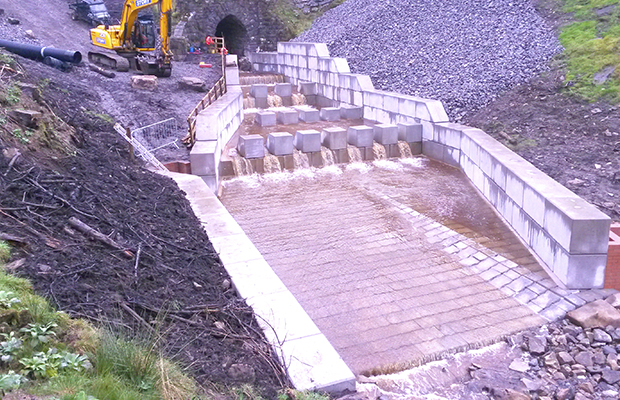 Starting in the early summer of 2015 and continuing until December 2015, the ‘Dodderham’ drainage works mitigated surface water and groundwater problems around the southern portal of Risehill tunnel. Concurrently, the ‘Risehill Up Side’ drainage scheme dealt with similar problems to the east of the tunnel approach embankment. Extensive land drainage schemes were installed, all emptying directly into Cowgill Beck. Work recommenced in July 2016, under the title of ‘Dent Embankment’. This third scheme, to be completed within just a two-month time slot, commenced with the stabilisation of the embankment at cess level over a distance of 62 metres on the Down (western) side. Stability here was achieved by means of a ‘Kingpost Retention Wall’. This involved driving hollow 339mm diameter steel piles, installed at two metre centres and reaching a depth of seven metres. The piles were filled with site-won aggregate, with the top 1.5 metres being capped with concrete. Cess retention was achieved by bolting 25mm thick vertical steel road plates to the tops of the piles. These are sunk to a vertical depth of 1.25 metres. The piles were also used as the anchor points for a continuous handrail. Important as this work was, the main action was to occur at the foot of the embankment. The slumping of the cess and problems with track alignment were symptomatic of movements occurring due to instability at the toe, with resultant slope failure. And the cause was easy to see – scouring caused by the fast flowing Cowgill Beck. Reconstruction of the lower slope of the embankment was required and, cleverly, the planned mitigation was linked with the construction of a complex river weir. When the river flows in spate, this large concrete construction has been designed to slow the stream flow around the base of the embankment. Additionally, it incorporates a substantial retaining wall that supports the repaired slope above and protects it from erosion. The water flows through a channel-shaped revetment structure that has increasing width and which falls with four distinct weir levels. Bevelled concrete protrusions from the revetment are designed to impede the water flow. 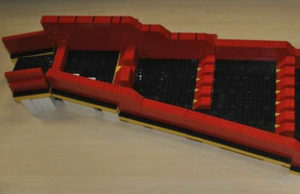 With limitations on the size of vehicles hauling to the site, it became clear at an early stage that the complex weir and water channel would have to be constructed offsite and assembled as a kit – enter the Lego set. Or to be more accurate, enter LegatoTM. The design work for the project was undertaken jointly by Story Contracting and engineering consultant AECOM. With the worksite being pretty much in the middle of nowhere and sited within a deep ravine, in-situ concrete pours were ruled out. 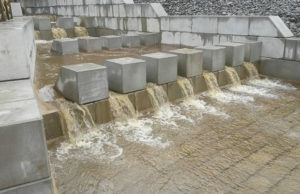 The decision was therefore taken to use pre-cast concrete interlocking blocks to construct the weir and retaining wall. Elite Precast Concrete of Telford is a specialist in this field and produces many ranges of interlocking blocks, troughs, anchor blocks, barriers and posts. Its Legato range seemed ideal. Is it a coincidence that the name sounds similar to those smaller plastic blocks we know so well? Apparently, it is derived from the Italian ‘legati’, meaning ‘joined together’. Lego on the other hand is thought to come from the Danish ‘leg godt’, which means ‘play well’. You can take your choice on that, but the name isn’t the only feature of familiarity. The overall proportions and the concept of male and female jointers mean that this product is like an adult version of the kiddie’s Lego brick. There’s nothing toy-like about them of course, weighing in at up to 2.5 tonnes each and formed from high strength (50N/mm2) concrete. Modelling the concept in Lego bricks sounds like a joke at first, but not so. With similar proportions to the concrete version, it made every sense. In fact, so useful was the Lego model that it became a three dimensional source of reference on site. It was also used as a briefing tool. By using the Legato product, AECOM was able to design a weir and retaining wall that is essentially self- supporting. There are no tie-bars or other fixing methods binding the structure together. Wet concrete was used to form the foundation, but thereafter it was just a matter of building up a kit of parts. Each block has a lifting eye cast into it, making the site work even easier. In total, some 245 blocks were used on the project. The Dodderham drainage scheme had involved extensive excavation. Rather than transporting the won materials off site, they were used to grade the access to the Dent Embankment scheme within the Network Rail boundary. Although it was necessary to transport blocks and materials into the site, no excavated materials have left it. In view of the narrow roads in this area, this was an important design consideration. Building a weir in an active brook isn’t the most straightforward of projects. What happens to all that water?! The answer in this case was to over-pump it. A ‘water retaining structure’ (a dam to you and me) was created at the outflow from the embankment culvert. Carrying out this scheme during the high summer was an obvious necessity, but even then things didn’t go to plan. With the British weather being what it is, the site bypass pumping was overwhelmed on two occasions. Each time, the resultant setbacks amounted to about three or four days of lost work. The embankment retaining wall is substantially built, again using the interlocking Legato block technique. As well as supporting the embankment, it acts as a water deflector when the stream is in spate. A porous pipe, wrapped in geotextile material, runs behind this wall to drain the embankment toe. It empties into Cowgill Beck downstream of the weir. The embankment toe behind the retention wall, including the erosion gully, was extensively excavated and then re-graded with rockfill. The entire three-part scheme was costed in at £2.4 million. The isolated nature of the worksite and the difficulties presented by the terrain and the weather has meant that some lateral thinking was required. The engineering solutions produced by Story Contracting and AECOM are a credit to both organisations. 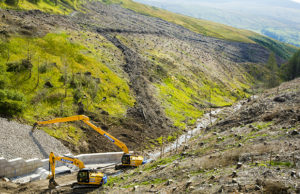 When Story Contracting completes its work at the Eden Brows landslip site in March 2017, the Settle and Carlisle line will be once again be a strategic through route, and will be in its best ever condition. Article originally written by Stuart Marsh for Rail Engineer November 2016 issue.